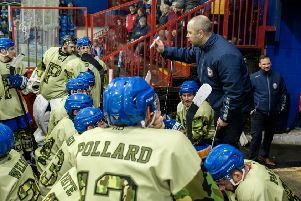 Phantoms coach Slava Koulikov has told his players to believe they can cause shocks during two daunting weekends of English Premier League action. The city side face reigning champions Basingstoke and 2016/17 title favourites Milton Keynes in each of the next two weekends. The daunting four-game run begins with a visit to MK on Saturday (7pm) ahead of a home clash against Bison (5.30pm). The fixtures are then reversed the following weekend. And Koulikov wants his men to hit the ice on a high following their 6-1 slaughter of Swindon last Sunday. He said: “We outplayed and outworked Swindon for 60 minutes last Sunday, and that is the standard of performance we need to produce on a regular basis. “If we do that, we’ll have a chance of getting results against any team in the league. “We have to respect the quality of the players that MK and Basingstoke have, but we also have to ensure our guys believe they are capable of beating them.